156. LASSETER'S GOLD. No Liability. "Company promoters were hungry for Lasseter's gold" . When Paddy Whelan started the Livesey Range Gold Rush in July 1932, half a dozen or so companies and syndicates were hastily cobbled together to be first in the field to peg ground over and around Whelan's spectacular gold discovery. Two of these Companies, rather indelicately, and with considerable irony, used Lasseter's name in their titles, both were 'No Liability' Companies of course. The Lasseter's Reef Gold Mining Company, No Liability. 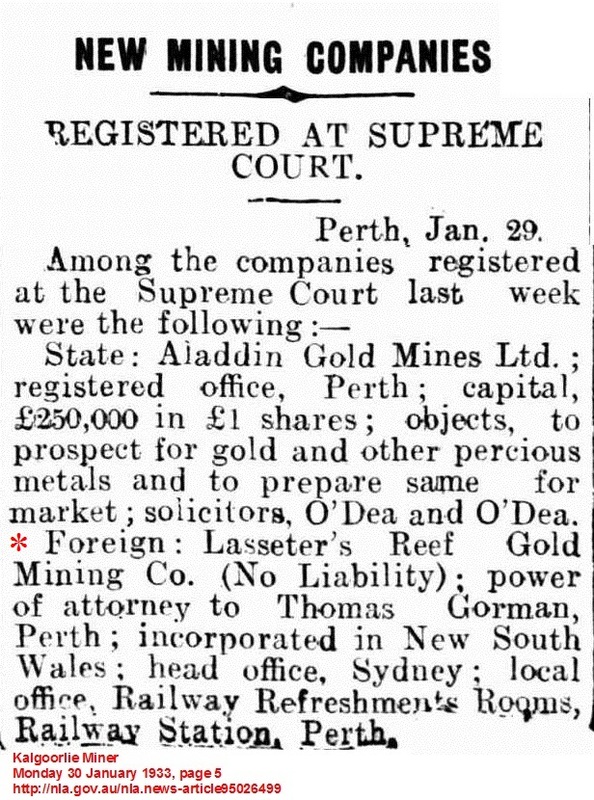 was registered in Sydney on 9/12/1932 and the following Monday the prospectus for Lasseter's Gold. No Liability, Western Australia, appeared in the Melbourne Argus. Errol Coote and Charles Lexius-Burlington were involved in the affairs of both companies. The Lasseter Reef Gold Mining Co. was raised in Sydney, only two executives were named, the Provisional Manager, John Frederick Dale and the Trustee, Keith B. Docker, a stockbroker who later went bankrupt speculating in gold mining shares and was delisted from the Stock Exchange. Apparently the Company's assets were 64 pounds invested in Livesey Gold Mines No Liability, an agreement of doubtful legality between Docker and Patrick Whelan, M. Gorman and T. Gorman, and the leavenings from any discoveries the Livesey Gold Mines made. The local office was the Railway Refreshment Rooms, Perth Railway Station, where Mr. T. Gorman carried on business as a caterer and solicitor, and held power of attorney for the Company. The Gormans', father and son, were forced to take out an injunction against Whelan to protect their investment in him, for it seems that Whelan had made a separate and unauthorised deal with the Livesey Gold Mines. While the West Centralian Company was in Kalgoorlie finalising arrangements for their expedition to the Livesey Range, Coote held a number of discussions with Dr. M. Gorman, "The Doctor suggested we take Whelan out to the reef in our 'plane," Coote agreed, but only if Whelan was ready to leave with the Expedition on the 1st of November. At the time Whelan was in Perth and incommunicado, (a number of reports have him cruising about the goldfields in a taxi) and not heard from until late the following month when he made Christmas headlines by being marooned, as a result of a plane accident, on a salt lake in the Great Victoria Desert. His expensive and very public rescue exposed the Gormans', Docker, Brearley from West Australian Airways and various colleagues and cohorts as perpetrators of a publicity stunt and a blatant fraud, subtle bureaucracy found ways and means to put Brearley and Docker out of business, the Gormans kept a very low profile and the Lasseter's Reef Gold Mining Company, No Liability and Paddy Whelan, a certain liability, disappeared. The prospectus for Lasseter's Gold, No Liability, Western Australia. appeared in the Melbourne Argus on 12/12/1932, it was a very expensive advertisement at more than 75 pounds and headlined as a 'Sound Investment', with a nominal capital of £10,000, in one pound shares. The provisional Directors were Charles Lexius-Burlington, Francis W. Stone and J. S. Richardson, who was also a Director of the West Centralian Gold Exploration Co. who were backing Coote, and the British Australian Mining Syndicate. The company had the usual objectives of a wild cat or Pitt Street mining company, that is to prospect for any minerals anywhere, buy and sell shares, options, leases and licences and trade on rumours, speculation and hope, the first place of operations would be the Warburton Ranges and Lake Christopher area. The Company had no assets but plenty of paper in the form of options to buy 10,000 West Centralian shares and their plant and equipment, including an aircraft and truck, for 2,000 pounds in a years time. Lexius-Burlington, opportunist that he was, simply took Coote's privileged information and his 10,00 options in West Centralian to the untapped Melbourne market and peddled the Whelan sensation under the guise of Lasseter's Gold N/L W.A., the Company's nominal capital of 10,000 one pound shares was backed by the 10,00 options in West Centralian. For his services as the Company promoter Lexius-Burlington would receive 500 fully paid shares in Lasseter's Gold N/L. and the right to buy a further 500 shares the following year. The Company never put a man in the field and was not directly involved in the Livesey Range gold rush, although Lexius-Burlington frequently and loudly reminded any who would listen, that he was ready and able to rescue Paddy Whelan, with a plane he didn't have. Shortly after Whelan was exposed as a bumbling conman, Lexius-Burlington left for New Guinea. Errol Coote, Hell's Airport. 258,259. National Archives Australia. Title, Whelan Rescue Operation. Series No. A705. Control Symbol, 153/1/758. Barcode, 533699. Sydney Morning Herald, 09/12/1932, pg.17. Melbourne Argus, 12/12/1932, pg.6.